With the sending of résumés as easy as a click of a button, job seekers today are pulling out all the stops to make themselves stand out. Sometimes that includes embellishing their résumés. A full three-quarters of HR managers say they’ve caught a blatant lie on a résumé, according to a new CareerBuilder survey. Co-workers are noticing the trend, too. A poll by OfficeTeam found that almost half of U.S. workers (46%) said they know someone who included false information on a résumé. That’s a huge jump of 25 percentage points from a 2011 survey. 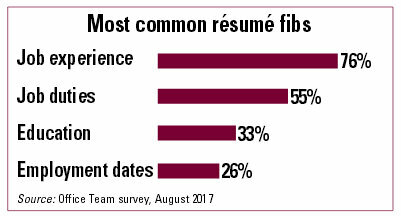 Employees in the youngest age category (18-34) are most likely to know résumé fibbers. One reason applicants lie is that they know HR won’t spend much time reviewing their résumé. In fact, 39% of HR professionals say they spend less than a minute looking at each résumé, and 19% spend less than 30 seconds. What are the pros and cons of offer letters?